really saved my money by finding out the right area of fault. Really great service by Rajeev. Exactly on time, was able to identjfy the problem correctly. thank you Vijay for quick turnaround and doing the job quickly. Refrigerator gas leak, fan motor fault compressor fault or condenser fault can be a probable reason why the rest of the refrigerator isn’t cooling. You must immediately call an expert professional to troubleshoot this problem. 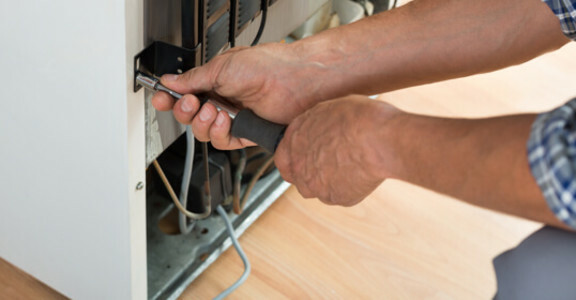 The professionalsare equipped with most of the current, fast-moving parts, to be able to fix your appliance the same day. Occasionally they do have to order parts from the company distributors, which sometimes can take one to five business days. Videocon refrigerators have a door alarm which buzzes when the door is left open for long or if the door is not properly closed. Therefore, this can be a reason why your refrigerator is making the noise. Refrigerant gas moving through the pipes can also be a reason. But if it’s neither, you can choose UrbanClap’sVideocon refrigerator repair service to call a Videocon expert who will look at the issue professionally. For most homeowners, the refrigerator is seen as one of the most important kitchen appliances. As the focal point of this area, it is important that you keep it in top shape. Since your refrigerator is used on a daily basis to store meals, preserve ingredients, and keep food cool, make sure you take care of problems quickly. If not, you could end up losing money on food waste, or even suffering illness.Videocon’s arsenal of refrigerator models consists of Side-by-Side, Frost Free, Titanium Frost Free and Direct Cool refrigerators. However, any trouble with your refrigerator meanscompromising with your food, health and regular lifestyle. So, in any case of break down, you can choose UrbanClap’sVideocon refrigerator repair service. This service assists you in dealing with any refrigerator related hitch. They spontaneously send an expert Videocon serviceman to your doorstep who resolves all or any of your problems. Open the UrbanClap website or mobile app to type ‘refrigerator repair’ in the search box that appears right in the front of both these portals. On typing this, a pop-up box will open with a questionnaire. The questionnaire is aimed at knowing the kind and brand of your refrigerator, your location, time etc. You have to answer all these questions to get your request uploaded. As soon as you will finish the whole process your request will be registered and a professional will be sent to your location to deliver service. Refrigerator not turning on: Use this option if your Videocon refrigerator is turning on. Refrigerator making noise: If your refrigerator is making buzzing sound, tick against this option to avail this service. Refrigerator not cooling: When your Videocon refrigerator is not cooling enough, you can select this option to get this problem fixed by a professional. Other: Pick this option if your refrigerator is facing any other problem. Why UrbanClap Videocon Refrigerator Repair service in Delhi? Guarantee: We provide guarantee of 30 days on our Videocon refrigerator repair service. Hence, if you face any problem with your repaired refrigerator during this period, we will have your back to resolve it. Professionals: All the professionals hired here are experts with their background and qualification checked thoroughly by us. We aim at providing best service and hence, we hire best servicemen. Insurance: Insurance of up to INR 10,000 is provided from UrbanClap’s side for customer protection against damage charges. Flexibility: Videocon refrigerators are available in different types, single door, double door etc. Hence, if you are availing Videocon refrigerator repair service, we provide service for all categories.